Here is a quick update on the ELD (Electronic Logging Devices) regulations coming into effect December 18, 2017, specifically how the CVSA (Commercial Vehicle Safety Alliance) will handle 'Out-of-Service' violations. On August 28, 2017, CVSA issued a letter to the FMCSA (Federal Motor Carrier Safety Administration) to confirm how the inspectors will be handling this new regulation. The inspectors will begin issuing citations for tractors operating without ELDs. They will not begin putting tractors out of service until April 1, 2018. This will provide the motor carrier industry, shippers, and the roadside enforcement community with time to adjust to the new ELD requirement with minimal disruption to the delivery of goods. These citations will affect a carrier's CSA score. 2) Chris Spear, American Trucking Associations, sent a letter to its members outlining recent discussions with the FMCSA and CVSA. To read the full letter please see the bottom of this post. "ATA has been communicating directly with FMCSA and CVSA to be sure that the implementation and enforcement of the ELD requirement is seamless and successful. Despite some media reports, CVSA is not doing ‘soft enforcement’ of the ELD requirement. Soft enforcement would suggest that the law will not be enforced. 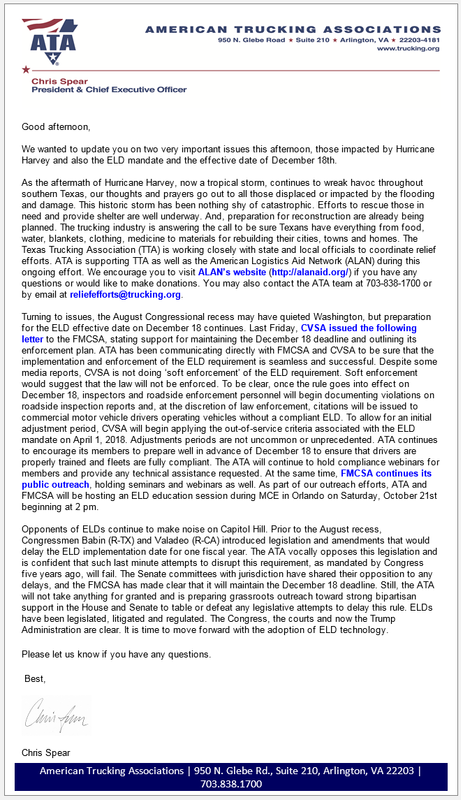 To be clear, once the rule goes into effect on December 18, inspectors and roadside enforcement personnel will begin documenting violations on roadside inspection reports and, at the discretion of law enforcement, citations will be issued to commercial motor vehicle drivers operating vehicles without a compliant ELD." 3) If you are new to ELDs and not sure if they are just compliance devices or actually efficiency tools, learn about our position by reading this post: ELDs: Pesky Compliance Device or Efficiency Creation Tool? 4) If you are a shipper and want to learn more about ELDs and their impact to your supply chain, please start by reading our Guide: A-Z On ELDs: A Shipper's Guide to Electronic Logging Devices. 5) If you are a professional Driver and want to learn more about ELDs and their impact to your career please start by reading our Guide: A-Z On ELDs: A Driver's Guide to Electronic Logging Devices. COMMENT BELOW: What are your thoughts on the ELD Mandate and how will they impact our industry on December 18th, 2017?